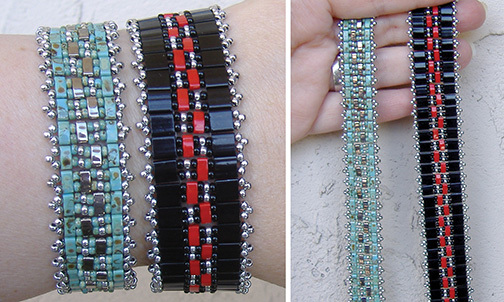 For Tila bead lovers, an easy bracelet made from size 11/0 Miyuki rocaille seed beads and Miyuki Tila beads! Step 1: Thread your needle with a length of FireLine that you feel comfortable working with and add more as you need it. NOTE: You will not be making a knot until Step 5 so keep the tension tight and hold onto this tail thread for now. You’ve just completed Row 1. Step 7: To start Row 2, string a new Tila bead. Step 10: Go around and across through the top hole of the Tila bead in the row below (highlighted in RED). Step 12: String three Color2 seed beads. Step 13: String a Color1 seed bead, a Color2 seed bead and a Color1 seed bead. Step 15: String three Color2 seed beads. You’ve just completed Row 2. Step 16: To start Row 3, string a new Tila bead. Step 19: Go around and across through the top hole of the Tila bead in the row below (highlighted in RED). Step 21: String three Color2 seed beads. Step 22: String a Color1 seed bead. Step 23: String a Color1 seed bead, a Color2 seed bead and a Color1 seed bead. Step 24: String three Color2 seed beads. You’ve just completed Row 3. Step 27: String two Color1 seed beads and a Color2 seed bead. 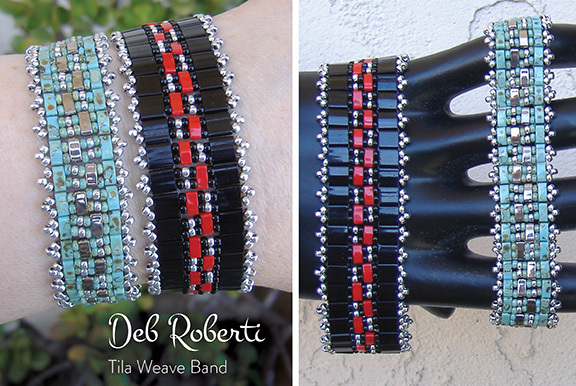 NOTE: To make your band longer, just add more beads than directed in this step and the next. Step 28: String two more Color1 seed beads. Step 30: To attach the clasp to the other end of your bracelet, thread your needle with the tail thread from Step 1.